Some of the best childhood memories I have are from eating my mum’s food. I would love it if our boys have similar memories as they grow up. Mum’s spaghetti bolognese was, and still is, to die for. My mum is natural good cook. If her cupboards and fridge seemed bare she would always produce something amazing from nothing. Mum pours her love ( and wine ) into her cooking “like water for chocolate” and her motto is always ‘to cook with abundance’. Mum is quite literal though, she’d cook enough for 10 people and yet we were a small family of 3! The secret behind mum’s tasty bolognese is that she literally throws in a bit of ‘this and that’ into her sauce depending what she has available to her. But mum swears on always adding red wine. 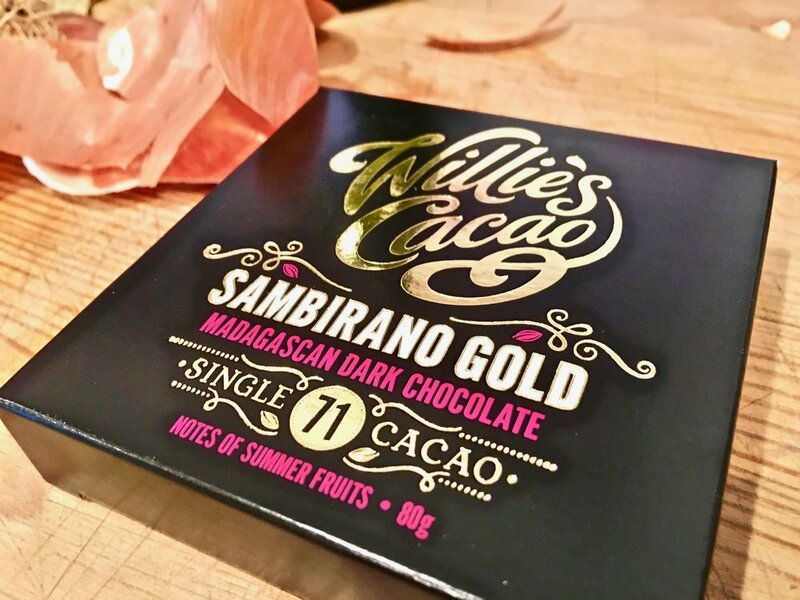 I have my own versions of mum’s recipe but nothing adds more richness than cacao. It’s changed my life! 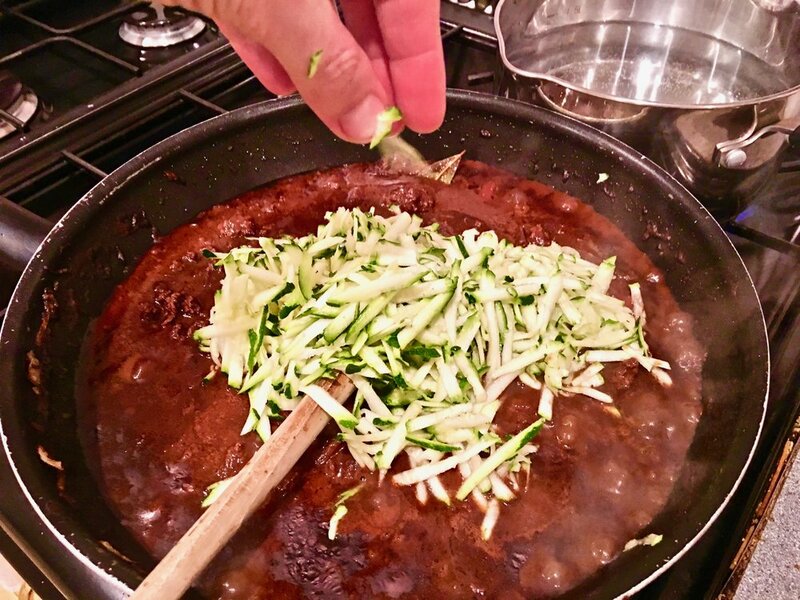 The colour of the sauce becomes a silky rich chocolate colour and yet it floods your usual spag bol with loads of extra nutrients for health benefits. This one is a goodie. Stays true to being super easy yet mega tasty. I’d recommend making this day before you plan to eat it. wholewheat dried spaghetti or fresh pasta or spiralized courgette! I use a deep wok type frying pan to make this sauce. Fry the chopped onions and crushed garlic on a medium heat until transparent. 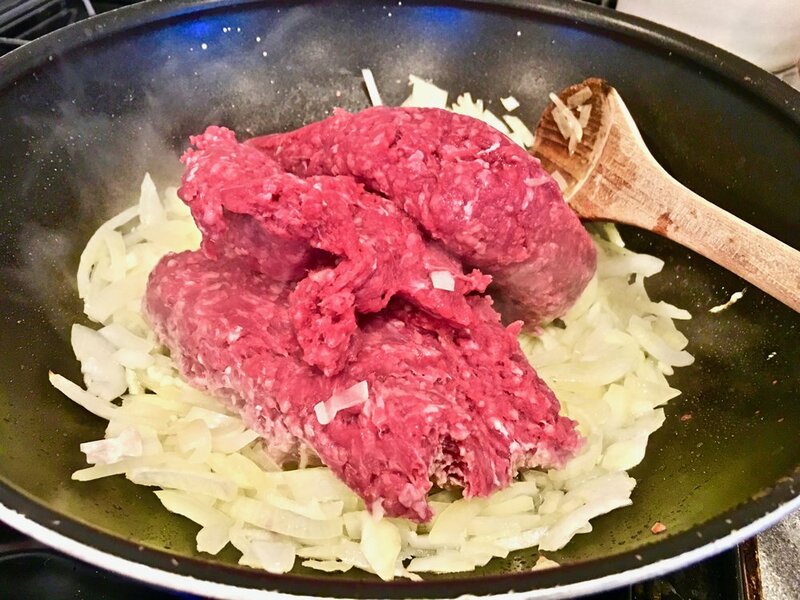 Add the beef mince to the pan and cook until brown. Turn the heat up to high and add the wine. Let it reduce down a bit before addng the tomatoes, paste, oregano, bay leaves, chicken stock and Lea & Perrins. Turn the heat down to simmer. Add the cacao and stir. Cover and let it simmer for 1 - 1.5hrs stirring occasionally. At the end of the cook I like to mix in the grated courgette and a big handful of torn basil leaves. Season with cracked pepper. No need to add salt as the Lea & Perrins does the trick. Make your spaghetti according to the packet instructions. Top your spaghetti with big spoonfuls of chocolatey bolognese sauce and top with fresh basil and cracked pepper. This sauce is rich in flavour, so for the kids I like to add in extra mixed vegetables, sweet potato & a little grated cheese which helps balance out the flavours for little mouths.